Eric West, Hpa-An (2016), digital C-print, 30" x 45". Blue Sky Gallery. There are many reasons a picture might move you. Perceptions come along and are eventually transformed by something else, and sometime it’s the everyday things — like, say, good or bad weather — that shake us up for another kind experience. During a recent week of heavy snow, I threaded the icy streets with Noah Dillon who was in town from NYC, so that we could stop into a few galleries around town. The most memorable of these visits was to Blue Sky Gallery. I was blown away by two rooms full of large format digital C-prints by Eric West, in a show titled Cityscape Burma. Was it because of the dicey walk it took to get us there; the images’ augmented hues and tones, due to the format of the photographic print; or that these were images of places I’d never seen or imagined? In short, yes. The show was also nicely presented, with the sequence of large prints given just enough space between, and enough images to keep up the entertainment. The saturation and scale of the pictures were immensely surprising, each print offering a pre-twilight view of charming Myanma buildings with various types of façades — from disrepair to heraldry — and measuring 30" x 45". 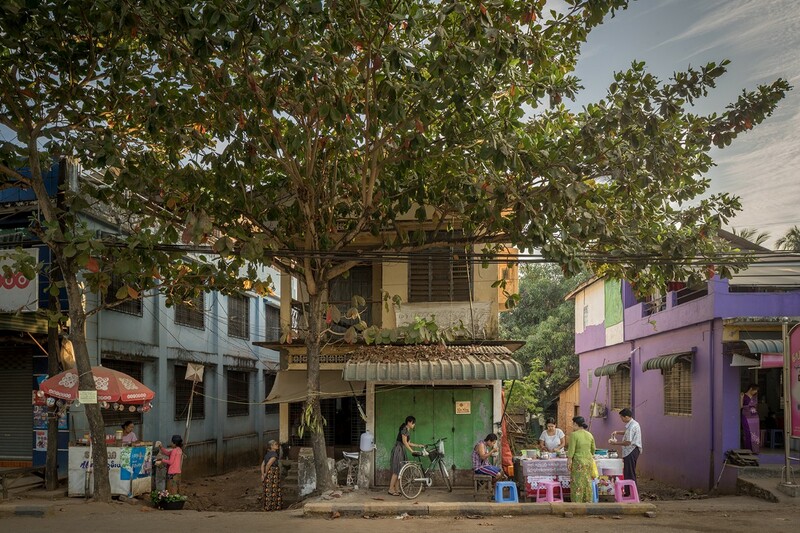 The pictures reveal a Southeast Asian culture as-is, during its transitional time as the so-called west made its way in; you can see this in Mawlamyine (2016), or Kyaington (2014) where mobile advertisements are stacked on top of each other, covering the exteriors of buildings. One imagines that modernity is being ramped up (city tenements, penthouses, condos, cars, and even motorcycles, are modern enough) by the digital age and tourism for this hitherto mainly Buddhist nation, in stupefying ways. 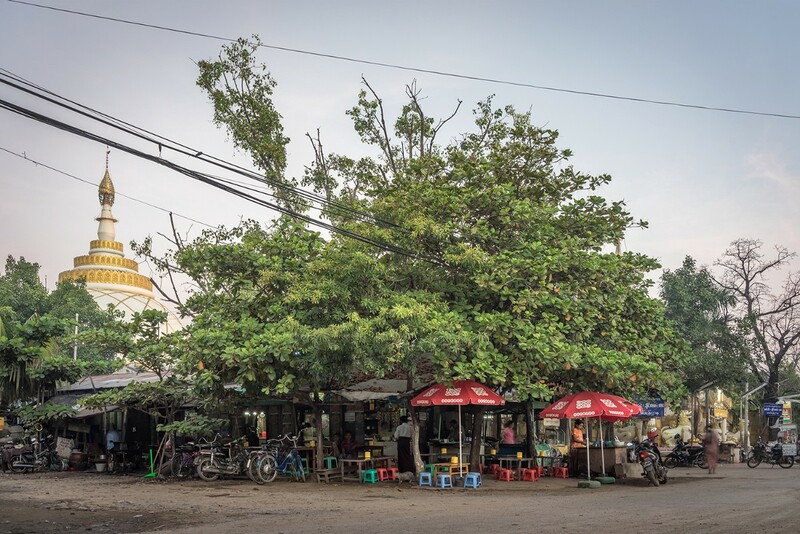 Eric West, Mandalay (2014), digital C-print, 30" x 45". Blue Sky Gallery. But being moved, I hadn’t considered the pictures’ modernity then, and knew nothing about the context of the city of Burma (now Myanmar). It was the dreamy sunset colors beset by the amplified contrast of the composition’s awnings or umbrellas, the little chairs, and the presence of watermelons, oranges, lemons and fronds; it was the immensity of trees in juxtaposition of the buildings they dwarfed, as in the stunning Hpa-An (2016), that for me, proved to be an absolute highlight of the trip. Another highlight from this show was Mandalay (2016), which bears what seems to be a kind of shanty with a giant banyan emerging from within and spilling over its slates.